Rivers transport great quantities of water and dissolved and particulate material to the world's oceans. Truly, "rivers are the gutters down which run the ruins of continents'' (Leopold et al. 1964). Water runoff from the world's land masses balances the excess of precipitation over evapotranspiration (Figure 2.2), but is very unevenly distributed by region (Table 2.1) and through time (Figure 2.3). Rivers transport about 15 billion tons of suspended materials annually to the oceans, and about 4 billion tons of dissolved material (Schlesinger 1997). Many aspects of climate, geology, and terrain contribute to regional variation in the solid and dissolved loads of rivers, and fluctuations in discharge are the primary cause of temporal variation (Figure 3.10). As discharge varies across all timescales including interannual, decadal, and longer, channels are shaped and reshaped in endless cycles in which the river seeks an equilibrium between channel shape and the forces of erosion and deposition, subject to the physical constraints set by water and sediment supply, and by elevational extent. From an ecological perspective, unidirectional current and transport are uniquely riverine characteristics. Current influences the growth and survival of individuals and populations through multiple pathways (Figure 5.2), and scouring floods can decimate periphyton and animal populations, resulting in system dynamics that are governed by episodic cycles of renewal and loss (Figure 10.8). Disturbance frequency is a key process influencing assemblage structure, acting like a switch to favor one group of organisms over another, and contributing to overall diversity by preventing the displacement of vulnerable species by dominant species (Section 10.3.3). Accidentally or deliberately, young fish and perhaps some invertebrates use current as an aid in their downstream travel. The dynamics of organic matter and nutrients within lotic ecosystems are profoundly influenced by the transport capacity of streams and rivers. On an annual basis, rivers carry to the oceans an estimated 0.4 billion tons of organic C, composed of roughly equal quantities of par-ticulate and dissolved organic carbon (Meybeck 1981). Forested headwater streams process coarse particulate organic matter (CPOM) in place, but are inefficient at processing the majority of dissolved organic matter (DOM) and fine particulate organic matter (FPOM), and so more is exported to downstream ecosystems than is metabolized (Webster and Meyer 1997). Lakes, impoundments, and floodplains can store substantial quantities of transported organic matter, and microbial processing within the lower reaches of large rivers (Cole and Caraco 2001) also may be significant. Nutrients are bioavailable primarily in dissolved inorganic form, and their downstream passage is most likely to be influenced by the stream ecosystem when biological demand is high relative to nutrient supply and when hydro-logic conditions facilitate uptake. In most years more than half of the annual nitrate export from a reference stream in the Hubbard Brook Experimental Forest, New Hampshire, occurs during spring snowmelt, from March to May, when both stream flow and nitrate concentrations are high (Figure 14.3). 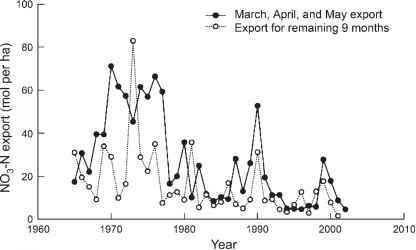 Similarly, a phosphorus (P) budget of a New Hampshire stream found that half of the annual inputs and two thirds of the exports occurred in just 10 days of the year (Meyer and Likens 1979). 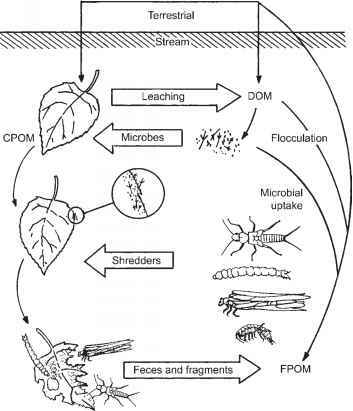 However, when bio-available N or P is added to a stream reach it is rapidly immobilized by the biota of the stream-bed, and can quickly finds its way into all trophic levels (Section 11.3.3.3). Thus, streams can occupy two ends of a continuum in terms of nutrient processing: a throughput mode at high discharge and a processing-retention mode at low flows. A full understanding of nutrient re-tentiveness at the stream reach and its scaling up to the network is an area of much current interest. If instream nutrient retention has contributed significantly to the nitrate decline described by Bernhardt et al. (2005a) that took place over several decades (Figure 14.3), then studies of nutrient cycling in forests and streams will need to be better integrated than has been true to date. Reach-scale studies have convincingly demonstrated the attenuation of dissolved inorganic N in transport by processes of uptake and transformation (Peterson et al. 2001, Webster et al. 2003), and this complements basin-scale estimates of nitrate removal, presumably due to denitrification (Alexander et al. 2000) and the cumulative effect of N removal along the entire flow path (Seitzinger et al. 2002). However, until we obtain a fuller understanding of the eventual fate of inorganic N retained in small streams, and whether it is permanently removed by deni-trification or exported in particulate organic forms, the importance of processes within the stream network to downstream export remains unsettled.